In addition to the new Star Wars and Disney Infinity-themed areas coming to the kids club area on the Disney Dream, a few more changes are coming as well! The changes will be seen for the first time on the October 26, 2015, 4-night Bahamas cruise out of Port Canaveral. 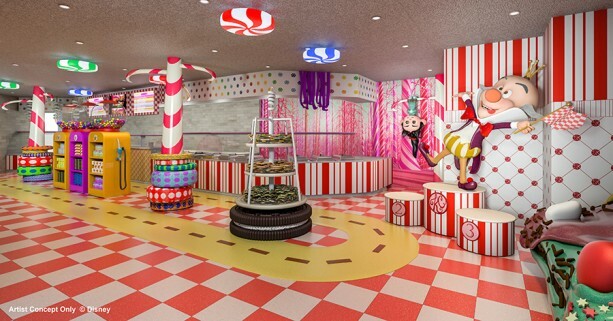 Located on Deck 11, Vanellope's Sweets & Treats will feature homemade gelato and ice cream, an assortment of candy, and novelty treats for purchase. The shop is designed to resemble Candy Land from the movie "Wreck-It Ralph." A Bibbidi Bobbidi Boutique will be added to Deck 5 where young guests can go to get Royal make-overs or be transformed into fierce pirates on Pirate Night! And on Deck 13, guest 18 and over will now be able to relax under Satellite Falls, a circular splash pool with benches and water fall.